Back to work in earnest now. 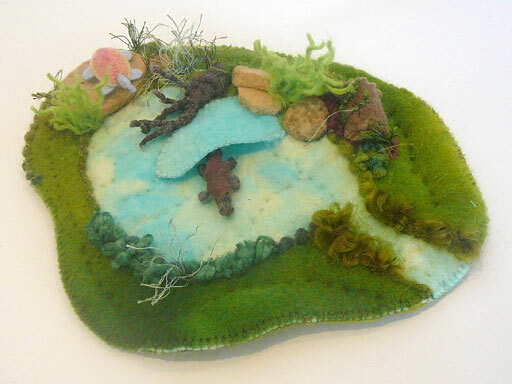 This piece returns to an Australian theme, depicting the habitat of a little animal that was thought to be a hoax when first discovered. It does seem to be a caricature with its duck bill, webbed feet and torpedo like body. As well it lays eggs and suckles the young from milk glands. All in all unique, utterly fascinating and such an important creature to preserve and protect. 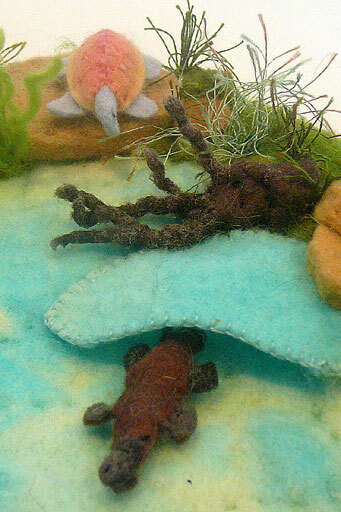 This small nature scape is intended to be a teaching piece to create awareness that the platypus, like many other species, has a struggle to survive as habitat is reduced and polluted. Dams, use of chemicals,l and clearing as well as a host of predators have had a significant impact. In-breeding and environmental stress have led to disease. 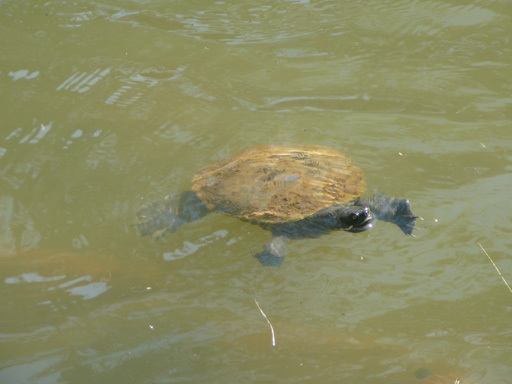 No doubt his companion, a river turtle, has similar problems. A recent visit to the Coomera River to observe the turtles brought to mind that this also must have once been a place where many platypus had lived. Occasionally some are spotted in local creeks and streams, which gives hope, but also awareness that so many have disappeared. This area of South Eastern Queensland is one earmarked for intensive development and yet has significant flora and fauna that seems to be destined for extinction. A really gorgeous piece and a really urgent concern. Thanks for commenting and even more a concern in light of recent changes that disregard the importance of the environment and climate change. What a beautiful piece. Felt is a perfect medium to explore this issue. Indeed- it has become a mission. I’ve always loved duckbill platypuses, since reading about them in our Animal Encyclopedia as a child. Such a whimsical beast! Love your little naturescape and the message it embodies: the necessity of protecting the earth and her creatures. Thankyou- it was good to explore the issuse and try to raise interest and awareness,they are unique ,endearing characters . Such a sweet spot to stop and considered God’s amazing creation. The variety in nature just astounds and impresses the heck out of me. Your creativity in recreating it impresses the heck out of me as well. You are too kind Kimberly- thanks for all the positive feedback.